I've been trying really hard to make this garden thing work, but I am hindered by forgetfulness and rabbits. I have a little green house, but everything in it got roasted by a heat wave. And I've been trying to grow things from cuttings, but I either over-water them, or forget to entirely. I tried to start small, with seeds, and it didn't go so well, and let's just say that seedlings and I have...a strained relationship. We shan't talk about the geranium, or the mint, or the tomato, or the lettuce. Or the parsley. Or the basil. Or the jasmine, which has turned dry and yellow, seemingly overnight. 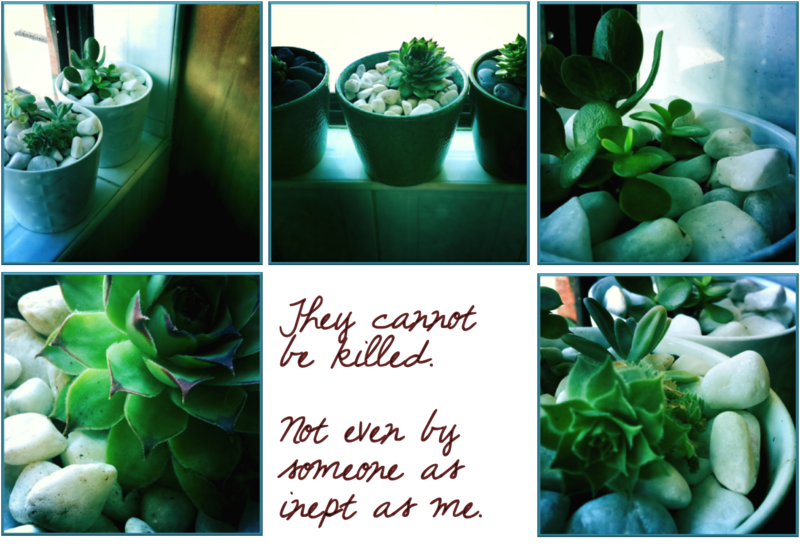 I am hoping that succulents will finally break the drought, so to speak. I do remember trying once before, with some cacti, but that ended badly. As a general statement, I'm thinking that things are going ok. TOUCH WOOD TOUCH WOOD TOUCH WOOD.